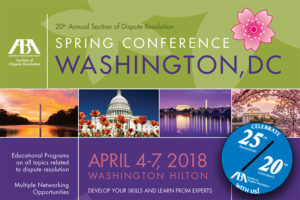 Jill and Martha, the Mediation Myth Busters, are presenting at the ABA Dispute Resolution Spring Conference in Washington, D.C. on Thursday, April 5, 2018, 10:00 – 11:00 am. Our topic is: Staying Neutral in a Biased World: The Neuroscience of Implicit Bias. Humans are not hard wired toward a particular bias but as a social species we are hard wired to acquire biases, both explicit and implicit. We will focus on the science behind implicit bias. We will elucidate the evidence that implicit bias influences behavior and how understanding the neuroscience suggests ways to manage biases in connection with mediation.